Bobby Thomson, who hit “the shot heard round the world” — an epic home run for the New York Giants against the Brooklyn Dodgers’ Ralph Branca at the Polo Grounds on Oct. 3, 1951, to climax baseball’s most memorable pennant drive — died Monday at his home in Savannah, Ga. He was 86. His death was announced by his daughter Megan Thomson Armstrong, who said je he had been in failing health and had recently had a fall. Memorably described in a play-by-play call by the Giants radio announcer Russ Hodges, Thomson’s homer endures as perhaps the most dramatic play in baseball history, a stirring conclusion to the Giants’ late-summer comeback known as “the miracle of Coogan’s Bluff” and a moment that has since resonated in popular culture. It was the bottom of the ninth inning in the third game of a three-game playoff. The Giants were down by two runs and the count was no balls and one strike. Branca, who had just come into the game, delivered a high fastball to Thomson, perhaps a bit inside. 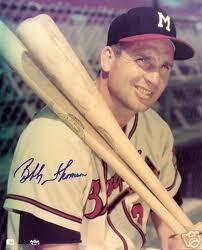 In the radio broadcast booth, Hodges watched the baseball fly off Thomson’s bat. “There’s a long drive … it’s gonna be … I believe — the Giants win the pennant! The Giants win the pennant! The Giants win the pennant! The Giants win the pennant! Another great one is gone. Bill Jempty Update- Here’s another video. At the 0:38 point of the video a young woman is seen clapping. That is my mother. RIP Bobby. He was not much of a defensive player but because of his good hitting did a good job filling in for the Yankees at catcher, first base, left fielder, and as a pinch hitter. RIP. Johnny Blanchard, who played in five consecutive World Series for the New York Yankees in the early 1960s, died Wednesday of a heart attack in Minnesota. He was 76. A key player off the bench when the Yankees won five AL pennants from 1960-64, Blanchard batted .345 (10-for-29) in the World Series overall and hit a pair of home runs as New York defeated Cincinnati in the 1961 Series. 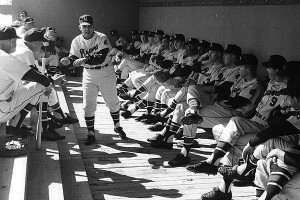 Blanchard was among the fan favorites at the Yankees’ fantasy camps, held twice a year at the team’s spring training complex. 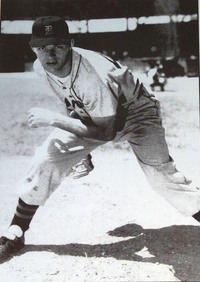 Blanchard was signed by the Yankees in 1951 and made his major league debut four years later at 22. He is one of four players in Yankees history to homer in four consecutive at-bats, accomplishing the feat over three games from July 21-26, 1961.